"She spoke enthusiastically, on the other hand, about moving to the Australian Outback." These could be the last. But the freezer is armed with their rendered cousins, who were cooked and spiced until deemed worthy to become the base atop freshly risen pizza dough. Zok is leaving under cover of darkness, and these will become my responsibility. The small ones are so tasty that they can just be eaten plain. The stripey green sort, Zok declares 'subtle' but I say they are untrustworthy with their flashy peels and strange shapes. "...someone stole the life from you...your heart is on the floor"
I have been ruminating for days about this posting,- March 26th by my reckoning is the year anniversary of Roller Derby entering my life. I did a search on my own blog for 'skating' and 'roller derby' and I read through some of my postings. I have definitely been on a journey, and I feel more kindly upon reflection over those postings. I didn't want to post negatively, and I also felt an urge to censor myself because of the negativity, yet I wanted to 'write it out'. A year seems unbelievable while the fact that I have only known Betty for less than a year, feels incredible for the opposite reasons. I met Betty and Fink in mid-June-! Betty is the closest thing to a real friend that I have had in all my time in Tasmania, and I would never have met her without Roller Derby. Of course she is enough like me that she essentially walked out of the life she created. She is braving it out in the world at large-and as we are on completely different date lines, I no longer have text messages in real time. I completely understand the what and the why of her leaving, and having done the same thing myself, all I can do is laugh about my first friend here, leaving the country. Anyway I look at that situation, I definitely owe Derby for Betty and Fink being in my life. Also I owe for the fun I have had skating in other places, Geelong, Queensland, and Hawaii, all part of the debt. I am also proud of myself for trying something so unlike the idea I have of myself. My long held dislike for sports, my fear of groups. In part I am also indulging myself, in my forties, to make up for the time I spent in my twenties, just making rent, or being the soft touch and covering shifts for friends, or my ill placed loyalty that caused me to be the type of assistant that was available to my bosses every whim upon my personal time. My conflict lies with Roller Derby in Tasmania. I actually feel more alone here because of Derby-I am apart of a group, but not with the acceptance or common ground I have in Geelong. I always feel like the new girl at school, offering myself all the time, and never being taken up on invitations. Certainly a lot of what happens isn't personal, but in an odd way it is personal exactly, because it isn't. 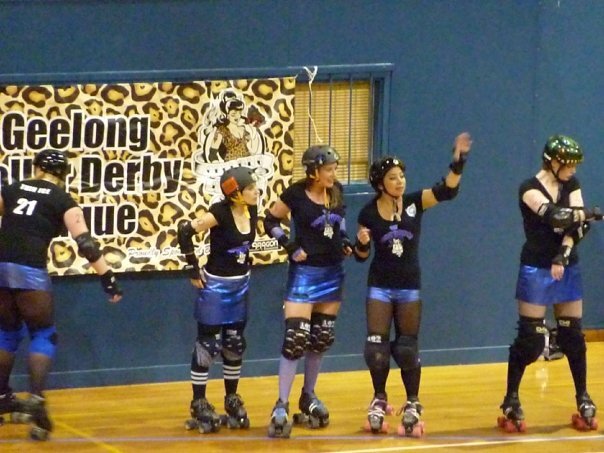 Looking back on my posts I also realized how much I have given up for Roller Derby. I was quietly happy; taking long walks, learning to sew, gazing at stars and sitting on the beach. Now my time goes to trying to engage a group of women, designing session plans, thinking of ways to convince them of what I know to be important from the experiences I have had, just to be mostly disregarded. I could write here about small improvements, but I am finding that too hard at this moment. Then there are the scraps of misconstrued impressions that the various women have of me, when so few have bothered to get to know me. I want to be proud of myself, I went to that first practice alone, then I went to a bout (in Melbourne) to learn more, when no one could house Betty and Fink I offered, and figured it all out, alone. I would speak up and offer ideas, yet continually be misunderstood. There was talk about going to a bout in August, but no one answered me back about going, so I booked a ticket and made my own plans. I had heard that 'dropping' into other leagues practices was okay, so I rented a Prius and offered to take any of our skaters with me to Geelong's practice, but no one wanted to go with me, so I went alone. This of course is how I got my opportunity to skate in competition, but this seemed to make me more of an outsider back on the island. My thought process is in this snarled loop, the league offers me very little. But without the league I have nothing in the way of Derby here on the island. 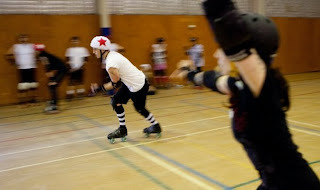 Yet, I suppose the telling sign of how Roller Derby has crawled in and set up house, is that I do have plans to continue. I keep coming up with plans, and just guarding my disappointment when the response is less what I wanted. I obligate myself a month or so at a time, knowing I won't back out of an obligation. 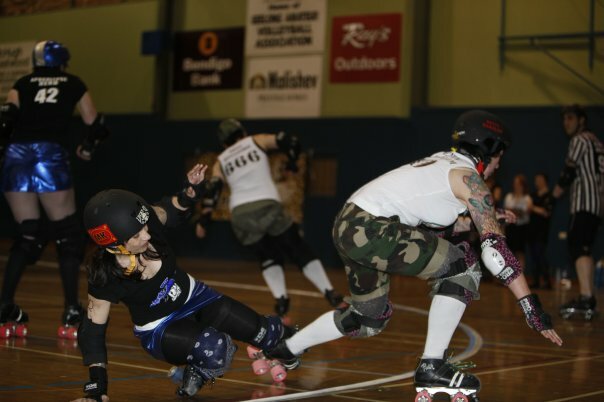 I can barely dredge up the memory of seeing the flyer here in Tasmania, I was with Monte, Roberto, and Zok and I idly said while taking a photo of the flyer- "Do you think I am too old for Roller Derby?" and pretty much they all laughed and said "Yes"! (insert a sort of snorting duh noise). ...see I, I could have danced on the sun...but my world came undone..."
I have written about what as seen through my eyes is the anarchy of the post office here in Australia. I wrote about the mop I mailed across the bass straight and then on across the country. This mop was not packaged, on advice of the post office I mailed the mop, as a mop, I was told to simply address the head of the mop. The whole experience was just very pioneer, very 'whose to tell us not too'? I have come to learn that this is in part due to the fact that many post offices here, are unofficial. Many are small businesses, a subsidiary and the the 'official' offices are much more 'postmistress-y'. This fact however lends itself to the problem of pricing, which varies. I say this all in a bit of a warning to my American friends, as I have read an article in the N.Y. Times regarding changes to come to the U.S. Postal system that emulate the Australian; no Saturday post, subsidiary shops run as small businesses. I have also written (recently) about the charm of honor boxes that still are prevalent in Tasmania. Tasmania is my only true marker of Australia, and we are a small part. So what I am about to relate to you, might have a lot to do with Tasmania and little to do with Australia country-wide. Zok and I walked up to the polling place yesterday to cast our votes. We had a small bicker about I.D., Zok reminded me to get mine, and I said automatically that we did not need to show I.D. As I was speaking those words my immediate thought was "What? How can one not need I.D. to vote?". I remembered asking at the pre-polling booth, but it didn't make sense to me and I mused about it all the way to the polls. Not only do you NOT need I.D., the voting area is totally open so that you can eye-ball your neighbors vote if you wanted to be that sneaky. I (as usual) put people off by asking the polling staff why they didn't ask for I.D. (I was rewarded with the usual blank look and no answer I often receive in answer to questions). I then put Zok off, by laying out many a hypothetical scenario (for most of our walk home along the beach) where I stole votes from all over our district and cast them to the party of my choice, by organized means. The staff at the polling place did think that the computer showed that a name had voted, so that a person registered could only vote the once. I thought that voting on a Saturday was rude. In America your employer has to let you go to vote. This is above and beyond your legal lunch time and breaks. Here, where the vote is compulsory, people have to go on a Saturday. In America people take time to 'get out the vote', to encourage like minded folk to educate themselves and get to the polls. Here, the vibe was more of a resigned sort of 'I hate going to the Dentist but I guess it is good for me' sort of mood. I even had to make my own cookies, because as is the Aussie-way there was only roast beast (aka sizzle fry) for sale. "Too much sun can make you blind"
Surely there is nothing I can say about the artists that die, that isn't being printed somewhere else with the immediacy of technology by persons with greater gifts of expression than I. Here is the aspect about blogging that I think is important to more than just myself. Many people connected by technology around the world are also as isolated from their peer group as I am. I am grateful to be able to spew out thoughts that would otherwise just take up concentration that I can't spare. Alex Chilton's music was introduced to me by my father, like so much of the music that came out when I was too small to find music on my own. Pop music is a step-child of the music industry. Many artists capable of making true pop tunes were not commercially successful. Many did better through some sort of brokering, such as other artists already famous covering their songs, soundtrack work, or (heaven forbid) advertising appropriating their music. Underrated music though has always been a bonding point. Someone you just met puts a 'Big Star' track on a mixed tape and through this your friendship is decided. Of course Alex Chilton through his many years put out more than pop music. I have just known many, many bands who tried to write a great pop tune and failed. Writing a great pop tune is deceptively hard. It is about working with very few tools, to try and do something unique. Alex Chilton was able to do this remarkable alchemy. "...and, if the Queen was to find it out, we should all have our heads cut off,..."
I clearly remember being in a library at Western Washington University, and while I should have been studying Statistics, but instead, decided to do some reading on the country of Australia. The very first thing that caught my notice was 'The Green Party', this is an actual party, perhaps not the strongest party, but a party with an actual presence. As the name denotes they have an environment first agenda. This is from their page regarding their history. "The Australian Greens is a confederation of eight state and territory parties which grew out of Australian environment movements in the 1970s and 1980s. The campaign to save Lake Pedder led to the formation of the United Tasmania Group in 1972. This was the first 'green party' in the world." (A side twist is that Peter Garrett of Midnight Oil, a band that was viewed as having its own environmental leanings, is actually a Labor Party member, which could be regarded as 'working within the system' but so far his track record is weak). The Liberal (oddly liberal in Australia by analogy would be Republican) and Labor (which historically was created in 1891 by workers who turned to politics) which is analogous to the American Democratic Party. I find as an American a third party intriguing, and from my research, voting outside the two strongest parties, is not a 'throw away' vote, but a vote that could actually make a difference. I found the below article exciting. As followers of this blog may know, I now have a vote. My first election is this Saturday, for state representatives of state parliament, this is called The Lower House or the House of Assembly. Tasmania as a state is touted as a state of 'unspoilt wilderness', and indeed much of our land is parkland, or protected UNESCO world heritage land. Yet politically that statement should not make the residents complacent. The Green Party of Australia is stronger than the Green Party in other states, and I find hope that environmentally Tasmania can stay on track. Currently, there is a battle going on regarding a Pulp Mill in the North. The amazing thing is that although short term jobs will be created, the mill is mining a (to take a leaf from Jared Diamond) finite source as if it is an infinite source, WORSE, this source is mined at a loss. 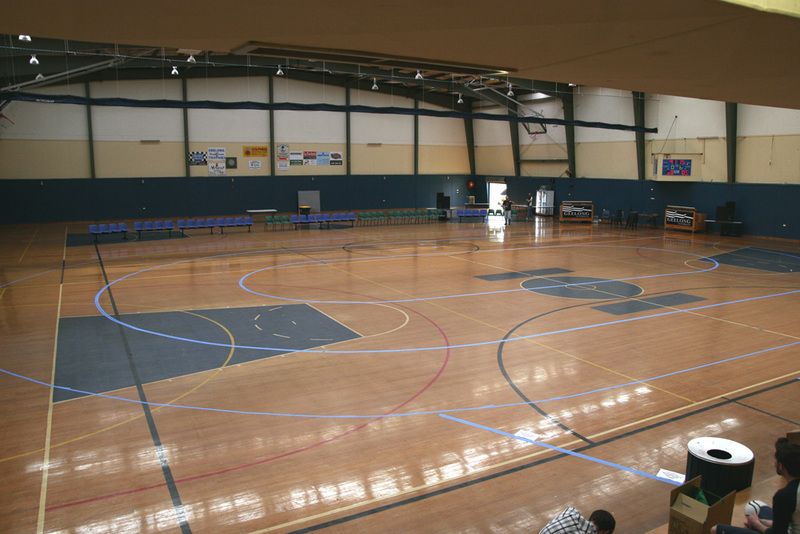 The wood chips are sold off at a loss and the products made from the wood chips are then imported back to Australia, increasing the original loss. I hope I am not the only person who has read Jared Diamond's 'Collapse: How Societies Choose to Fail or Succeed', there are twelve lending copies in the state, and when I checked today, half were currently checked out. I hope also the popularity of 'Freakonomics' and 'Superfreakonomics' perhaps has impacted on people the history of unintended consequences of laws and policies. I could have voted outside my library, in 'pre-voting', which is to add convenience to balance out compulsory voting. Like a looming test, I felt I needed until Saturday, to read up on my candidates. I also want to see what an official polling place is like. Also Zok is home, and due to his gallivanting ways has only voted at a polling place less than ten times in his life! Early in the year 2003, while I was feeling for the most part isolated, as I was living alone in Bellingham Washington, attending Western Washington University - http://www.cob.org/. Bellingham is closer in distance to the country of Canada then to the city of Seattle which had been my home for ten years previous. However, I was 'oh so determined' in my mid-thirties to obtain a degree. Not only was I isolated physically, I was also isolated mentally from my previous life. I was playing student with all the trappings. I ate badly, slept little, hid away in the gorgeous libraries of campus, and well, I am sorry to have to be so truthful, dreamed of being Hermione Granger. Western Washington University is a beautiful campus, with modern art as well as the style of buildings one might dream up for a University. But I digress this story isn't about Bellingham, this post is a memorial to Sweet Pea. Sweet Pea is what I named my first iPod, a second generation, 10 gig, black and white, gift from my boyfriend, Zok. (Get it? Pod, Pea? Pea Pod. Later came Fancy Pea (video), and Weenzie Pea (shuffle)). I had glossed over the invention of the iPod, because the beginning of digital music was too close to the world of the music industry I had left behind. Therefore, I sort of ignored Sweet at first, I mean really, "How indulgent! ", and strange, thought I. Yet, when I got close to graduation, and closer to what would become almost two years going from city to city, and country to country without a permanent home. Of course during this time, I was living out of a large red suitcase, and I certainly wasn't toting around my vinyl collection. Sweet Pea as one might guess became indispensable. I also conducted an experiment, I left my iPod on shuffle for close to two years. I found that the shuffle function never cycled through all the songs. I started to watch tutorials about iPods on the internet. I actually became quite well versed regarding iPods, I found myself helping strangers on planes when their screens went frozen and they did not know how to reset. I wrote letters to Apple suggesting improvements they might want to consider for their next generation of iPods. When Zok and I finally bought a house in Blackmans Bay around early 2005, I decided as my iPods' were plentiful, that Sweet Pea would become the 'house' iPod, this meant that the music on the iPod would be very carefully thought out. I spent years getting the exact balance I wanted. Other iPod owners marveled at Sweet Pea's long life, Zok stated that Sweet Pea was 'one-hundred and sixty' in technological years. Alas, a few weeks ago, songs started to just go silent part way through, a little more silence, day by day, until nothing remained but a blank screen. 'The day the music died' to enact a cliché. Sweet Pea, like 8-track, and cassette before her is not easily replaced. Even if I could get another iPod of the same generation, she could not be replaced in my heart. "But I still do it even now and then, sort of to keep my hand in." Although the stolen berries, in amount, were not comparable to the amount of fruit we had from the trees in the yard. I have learned that one small girl and her mostly absent husband can only eat so much preserved fruit over the course of a year. I definitely have enough jam, preserves, and straight out fresh-frozen berries to cheer up many a coming winter night. My patch is experiencing a warm yet rainy morning, which is perfect for all my required reading, as school officially starts today. Zok made a design on one of the pies, depicting the 'scene of the crime' where the berries were taken from. "Wednesday morning at 5 o'clock when the day begins"
The days continue on without my full presence, and my time is not my own. The sound of the surf is very loud, the waves crash so that I can hear them through my open windows and open doors. I am rendering down berries for the impending cold days, I feel the days shortening just as I see the darkness creeping into my evenings, making each day shorter and shorter. Here is the beginning of a pie, which I will enjoy all the more as the berries were stolen and involved much dust, electric fencing and the mooing of cows.